There are many legacy LS3/5As up to 35 years old that still work very well. This is the page to try to help fix those that don't. There are only 4 major components to the speaker, the cabinet, the B110 bass/mid driver, the T27 tweeter and the crossover. The LS3/5A was manufactured by several licensees during its lifetime including Rogers, Spendor, KEF, RAM, Chartwell, Goodmans and Harbeth. 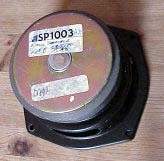 By 1987 too many B110 SP1003 drive units were falling outside specification and so KEF redesigned the speaker using the B110 SP1228 drive unit. This required a redesign of the crossover circuit. These two versions are usually known as the 15 ohm LS3/5A and the 11 ohm LS3/5A. If you are unfamiliar with the inside of the LS3/5A then following links are a good starting point to familiarise you with what to expect when you open one up. 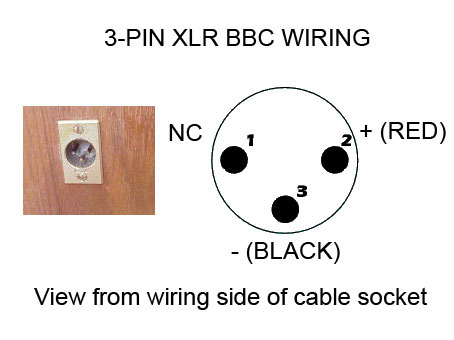 The BBC used XLR connectors as a standard on their loudspeakers and so you may come across some pairs with a chassis mounted 3-pin male XLR connector fitted. Pin 2 = + (red) and pin 3 = - (black). Pin 1 is not connected. This is a RAM but the baffles of all LS3/5As should look substantially all the same. The T27 has a square felt surround to prevent interference effects associated with the cabinet edges and the tweeter dome is covered with a metal grill for protection sourced from a Celestion HF2000. This grill has a small effect on the frequency response which was considered beneficial as it raised the output a high frequencies. In some cases this may have been removed by an owner wishing to "improve" the speaker. The grille is a Celestion part from the HF2000 tweeter. It is fixed with contact adhesive like Evostick. Around the tweeter are glued 4 pieces of square section felt. These damp the reflection between the tweter and the edge of the cabinet. Both the grille and felt are an important aspect of the design and change the sound of the speaker. The Velcro around the edge of the baffle is usually fixed with staples. The cabinet external dimensions are 31 x 19 x 16 CMS giving a internal volume of close to 5 litres. Early BBC Reference LS3/5As used 9mm plywood but the cabinet walls in manufactured LS3/5As are made from 12mm (0.5 inch) selected birch plywood with internal fillets from beech. Because of the critical nature of the design it was found that the substitution of other wood for the walls or fillets caused clearly audible changes. The use of any hardwood for the beech fillets produced a audible colouration caused by the resonance of the B110 on its chassis. The inside of the cabinet walls are lined with car body damping panels, a single layer is used on the side walls and two layers on the top and bottom. All internal surfaces except the front panel are lined with polyurethane foam; 25mm thick on the top & bottom and 16mm thick on the sides. The cabinet, including the screw holes, is carefully sealed. The LS3/5A grille frame is made from a piece of 1/4" 5 layer Birch Plywood with the Tygan stretched over it and stapled at the back When subjected to heat the Tygan shrinks tightening up the grille. The material specified for the LS3/5A grilles is Tygan which was made by Fothergill and Harvey in Manchester. Tygan is no longer manufactured and the only sources are from surplus stock. The manufacturers described it as having low sound absorbtion and impervious to water, oil, most acids, dirt and moths! 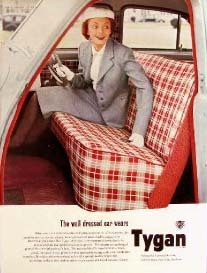 Apart from loudspeaker grilles the best known appllication for Tygan was deck chairs but other uses included car seats and blinds. Tygan is is woven from monofilament platic yarns developed in the USA but produced in this country under licence by BX Plastics of Manningtree Essex. LS3/5As are balanced for use with the Tygan grill in place. Tygan is a woven thermo-plastic monofilament which is no longer made. The grille is attached to the baffle with Velcro and pulls off although it may be quite difficult to remove. Don't use a screwdriver or other metal object as a lever because you are sure to damage the veneer on the edge of the cabinet, instead use something like an old plastic credit card. To open the cabinet remove the eight screws around the edge of the baffle. They may be hidden under the Velcro and may be wood screws directly into the batten, or machine screws which are tightened into threaded fixings. Once removed the baffle should be free to lift out. In many cases it will have become stuck and need a little help. Try placing the speaker face down on a soft surface like a blanket and giving the back of the cabinet a gentle thump with your hand. If this does not work then a metal hook inserted into one of the screw holes at the edge of the baffle should allow you to pull it free. Once opened you should find the crossover printed circuit board mounted behind the T27 tweeter. There should be a felt pad between the board and the tweeter. The 15 ohm version crossover boards were made by the manufacturers themselves or by a sub contactor and so differ slightly in appearance. 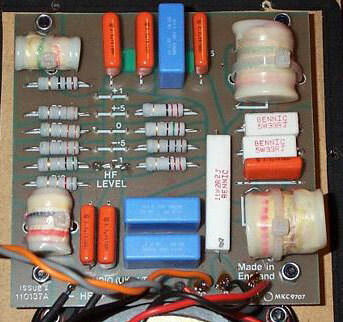 In the case of Rogers' LS3/5As the board material changed during the long production run of the speaker. The LS3/5A FL6/23 crossover changes have been well documented on the Falcon Acoustics web site. This FL6/23 crossover shown was made by Chartwell. At this point in manufacture the licensees made up their own crossovers or bought them in from sub contractors like Falcon Acoustics and so variation in printed circuit board colour and layout is seen. 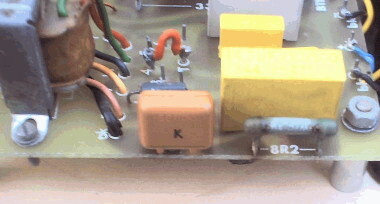 The response of the B110 is equalised by the 1.53mH inductor and 82R resistor. The 6.2uF capacitor, 2.67mH inductor and 33R resistor compensate for the hump in this characteristic. The crossover frequency is 3kHz. L3 operates as a shunt inductor for the T27 tweeter and is adjustable to allow matching of different sensitivity T27 and B110 units. The usual tap position is 4 or 5. Derek also told me that Spendor 15 ohm LS3/5As did not use a tapped inductor because they tightly selected the drive units. I presume then that the Spendor inductor was 0.3mH to ground with the input and output across the top of it. C2 to be made up of the above combinations of C2a and C2b in parallel. The main problem with the 15 ohm crossover is that R4, runs very hot. 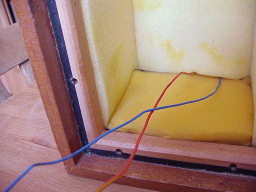 Examples are common where the polyurethane foam on the adjacent cabinet wall and the nearby crossover capacitor have melted. Changes in the value of R4 due to heat ageing are very likely and may be expected to affect the treble. 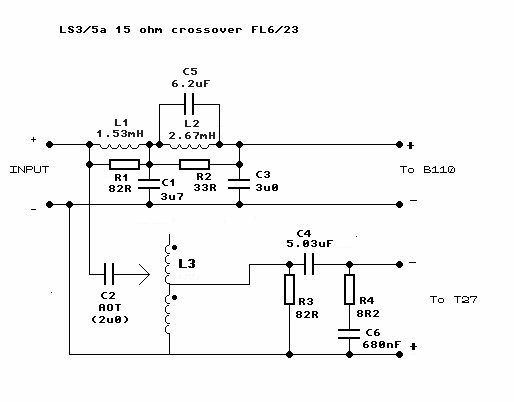 In extreme cases damage to the HF crossover components can occur if a LS3/5A has been fed with prolonged high level HF energy. 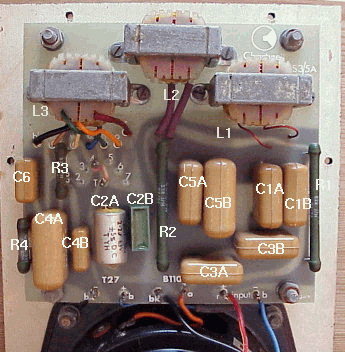 The Rogers crossover shown on the right was removed from a 15 ohm LS3/5A used in a professional studio where muting was not applied during fast tape spooling. 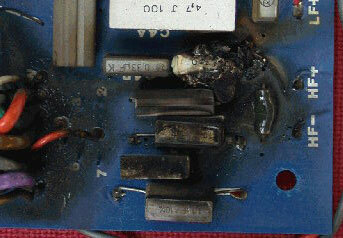 The tweeter had gone open circuit and the heat generated had melted all the capacitors and burnt out all the components in the HF section of the crossover. Extensive scorching of the PCB is evident. Other problems can include one of the three crossover inductors going open circuit, or less likely developing a shorted turn. The inductors are almost impossible to find now and if this is a problem it may be worth investigating specialist transformer companies to see if they can rewind it on the original core. 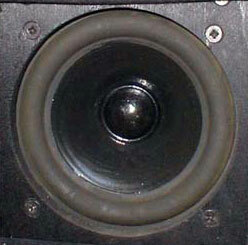 After 1987 all LS3/5A crossovers were manufactured by KEF and supplied as complete boards to the manufacturers. This was because when a speaker fell out side specification there had been disagreements between KEF and the licensees each blaming the other for the problems! With KEF supplying both drive units and crossover this source of conflict was resolved. Greater consistency of B110 manufacture and a smoother response meant that the new crossover could be simplified, eliminating the costly autotransformer used in the older version. Matching of relative sensitivity between the B110 and T27 was now achieved with a resistive ladder. The new crossover made bi-wiring possible and although LS3/5As were always used by the BBC with the terminals strapped, this made the speaker more attractive to consumers. This example is from a Harbeth 11 ohm LS3/5A but all manufacturers should look the same. Instead of the tapped transformer used in the 15 ohm version the newer crossover uses a simpler resistive ladder to set the level to the T27 tweeter. The bass/mid drive unit is a KEF B110. Before 1987 the 15 ohm version LS3/5A used a KEF B110 SP1003. Post 1987 the 11 ohm version used the KEF B110 SP1228. Note that some Rogers units with serial numbers in the 30,000 series are actually 11 ohm units although the factory was still using the old 15 ohm label. It is quite difficult to damage a B110 during normal music use. The speaker has a limiting stop and excessive cone excursion will result in a nasty cracking sound which usually has the user diving to turn the volume down before any damage has been done. In cases of severe damage it may be possible to have a B110 re-coned or the surrounds replaced. Richard Allan's sister company Recone Lab have sucessfully repaired B110s in the past. At the time of writing they are not taking orders but check their web site for more information. I have also seen new surrounds for sale on ebay but cannot verify the effectiveness of this as a DIY repair. Examples of off-centre B110 drive units are occasionally found and will cause a grating sound on programme material. It is worth trying running the whole speaker upside down and if this cures the problem the B110 can be turned upside down on the baffle. The 15 ohm BBC design used B110 SP1003 drive units right at one end of their spread of specification. As a result many otherwise perfectly good units were rejected for use in the LS3/5A. So there are many examples of 15 ohm LS3/5As where the drivers have been replaced with B110 SP1003s bought secondhand and pulled from old KEF speakers. The balance may well be affected and the LS3/5A may will fall outside original specification. Sometimes the dust cap in the centre of the B110 cone comes loose. It can be re-glued with PVA adnesive. B110 A6362 4-8 ohm 1967-early 70's. Unpainted frame, doping on front of Bextrene cone. Neoprene rubber surround. 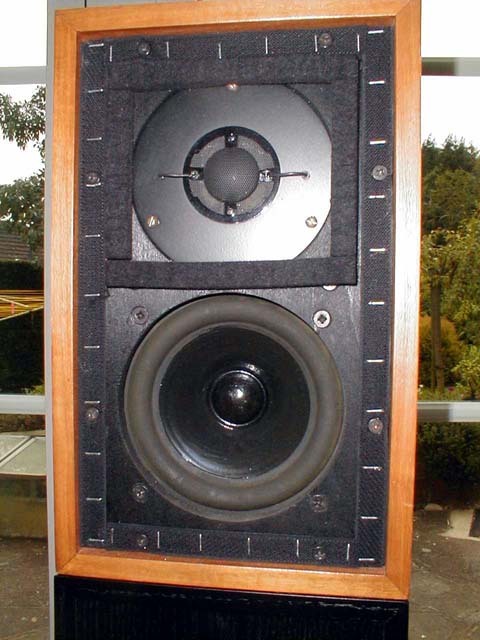 The A6362 was used in the original LS3/5, KEF Cresta and early Concerto. B110(A) SP1003 8 ohm early 70's-early 90's. Used in the 15 ohm LS3/5A but selected because the BBC design used units right at one end of their design spread. Some have unpainted chassis but most are black. doped front Bextrene cone and Neoprene rubber surround. Also used by IMF. B110C SP1228 6 ohm 1987-late 90's. Used in the 11 ohm LS3/5A. Black chassis, higher power voice coil materials, Bextrene cone doped on back, PVC surround, production restarted 2002 in China. Also used in the Rogers AB1 woofer. B110B SP1057 8 ohm Mid 70's-early 90's. Black chassis, higher power voice coil materials, Bextrene cone doped on back, PVC surround. Used in the KEF Cantata, R101, R105/107s. 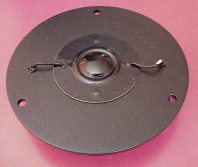 B110 SP1190 used in the KEF 104/2 speaker. KEF drive units had a date label in the form of a letter and 4 numbers. A = January, B = February through to L = December. The first two numbers gave the day of the month and the second two numbers the year of manufacture. So this B110 SP1003 with the date code B0777 was manufactured on 07 February 1977. The main problem found is open circuit T27s. In this case the only practical solution is to replace the unit. 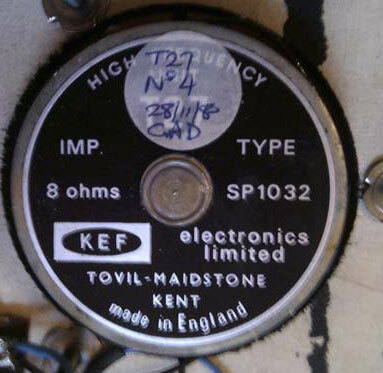 The T27s are no longer made by KEF and I do not know a source of NOS (new Old Stock) but the good news is that the tweeter, unlike the B110 driver, was not specially selected. So a secondhand working T27 SP1032 will be fine as a replacement. They come up on ebay quite often. Make sure that you get the SP1032 version. Replacement is quite easy, you will just need a few hand tools and a soldering iron. 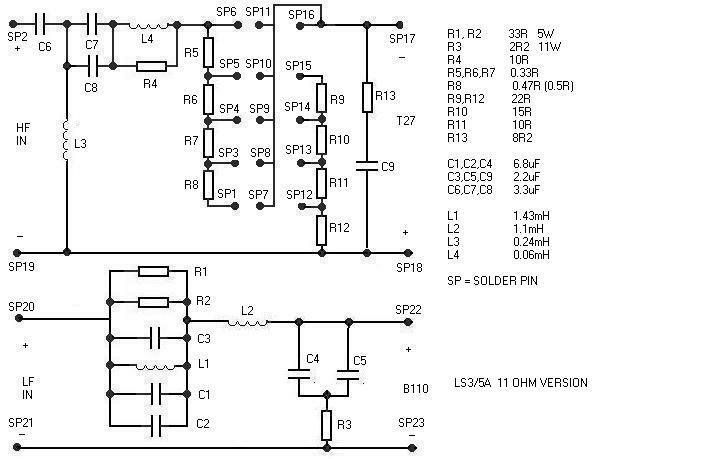 You will need to salvage the tweeter guard from your faulty unit or try to source one. It is glued in place with a contact adhesive like Evo Stik and rather than try to lever it off I would be inclined to soak the whole faulty tweeter into some solvent. Evo Stik sell a cleaner/thinner whch I believe is Toluene (Methylbenzene) based. Or petrol should do. Both of course are highly flammable and the fumes are hazardous so be careful. Do it outside, don't breath the fumes and make sure that there is no fire hazard. It is important that the LS3/5A cabinet is air tight and care should be taken to ensure there are no leaks through screw holes. Ensure that the screws and nuts securing the drivers and crossover are not loose but do not over-tighten the screws holding the drive units. Doing so will distort the frame of the B110. Ideally the old rubber sealing strip between the baffle and the cabinet should be cleaned off and replaced. The air-tightness of the re-assembled cabinet can be checked using the box test. Please see the Tweaks page for more information. 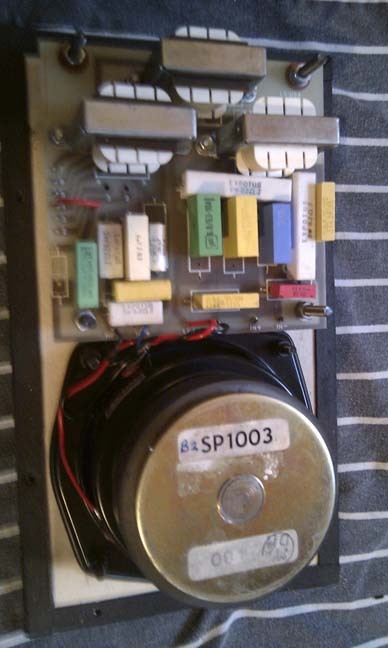 Spare parts are often available on ebay although caution is required particularly when replacing the 15 ohm version B110 SP1003 bass/mid driver. See above. Audiofriends in the Netherlands have replacement surround repair kits for the B110 SP1003. They also have an ebay shop.